On sand and snow for Hitler . . .This book is built around two recently discovered war diaries one by a member of the 23rd Panzer Division which served under Manstein in Russia, and the other by a member of Rommel's AfrikaKorps. Together, along with detailed timelines and brief overviews, they comprise a fascinating "you are there" look at the German side of World War II. 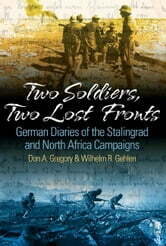 The stories are told primarily in the first person present tense, as events occurred, and without the benefit (or liability) of postwar reflection.The assignment of keeping the first diary was given to a soldier in the 2nd Battalion, 201st Panzer Regiment by a commanding officers and the author never saw fit to include his own name. This diary covers the period from April 1942 to March 1943, the momentous year when the tide of battle turned in the East. It first details the unit's combat in the great German victory at Kharkov, then the advance to the Caucasus, and finally the brutal winter of 1942-43. The second diary's author was a soldier named Rolf Krengel, and the diary was the original, handwritten copy. It starts with the beginning of the war and ends shortly after the occupation. Serving primarily in North Africa, Krengel recounts with keen insight and flashes of humor the day-to-day challenges of the AfrikaKorps. During one of the swirling battles in the desert, Krengel found himself sharing a tent with Rommel at a forward outpost. Neither of the diarists was famous, nor of especially high rank, and no books have been written on their military careers. However, these are the brutally honest accounts written at the time by men of the Wehrmacht who participated in two of history's most crucial campaigns.DON A. GREGORY, is a Professor at the University of Alabama in Huntsville. WILHELM R. GEHLEN joined the French Foreign Legion and served in Indochina and North Africa. The authors previously collaborated on Mr. Gehlen's childhood memoir, Jungvolk: The Story of a Boy Defending Hitler's Third Reich (Casemate 2008).